Together these networks cover 137 sites where a variety of physical, chemical and biological measurements are made, using a variety of data collection methods - from field sampling to automated telemetry. Whether you are looking for something specific or just want to browse our data holdings, you can use our data exploration tools to help you find the data that you need. Data Discovery Portal - this interface will allow you to view detailed metadata (in formats compatible with the Gemini 2 and INSPIRE metadata standards), geographical information and (where possible) time series graphs from each dataset collected by our networks. Publications Catalogue - this interface allows you to search our publications catalogue, allowing you to see how data from our networks are used and how they contribute to environmental change research. Site Information - this interface will allow you view information about the 137 sites that make up our networks. You can use our visualisation tools to plot time series and scatter plots of our data. You can also view environmental indicators, weekly site photos and map-based data. Data Explorer - this interface allows you to plot any variable in our terrestrial site summary data against any other. You can customise the plots to show the sites and variables you are interested in. Where appropriate, there are also links to the NBN species distribution maps to provide the national context to this site-based data. Time Series Viewer - this interface produces direct and dynamic access to time series from the the ECN summary database. You can query this database for selected sites, date ranges and measurements to create graphical time series and data tables. UKLEON telemetry - this interface provides direct and dynamic access to the UK Lake Ecological Observatory Network (UKLEON) data. UKLEON has state-of-the art, self-cleaning sensors at eleven lakes across the UK. This interface will allow you to view the data in near-real time from these lakes via GPRS. Environmental Indicators - this interface provides data for a range of climate change, water quality and biodiversity indicators. 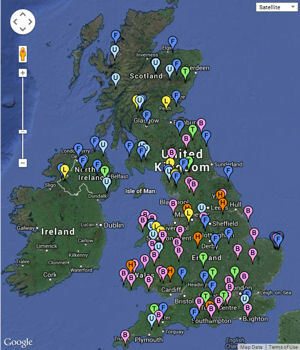 Weekly Photo Archive - weekly photos are taken at a number of our sites and this interface allows you to search these. Our datasets are available, under an Open Government licence hosted on the CEH Environmental Information Platform, for detailed analysis in your research. Digital object identifiers are available for these datasets enabling easier citation of our data. You can also access and explore our data through the variety of interfaces available on this web site. How We Manage Data - Find out details about how the ECN Data Centre manages and stores data. Performance Indicators - the ECN Data Centre uses a variety of indicators to measure its performance. Preparing your Data - Resources to enable our site contacts to prepare the data prior to submitting it to the ECN Data Centre (site contacts only).